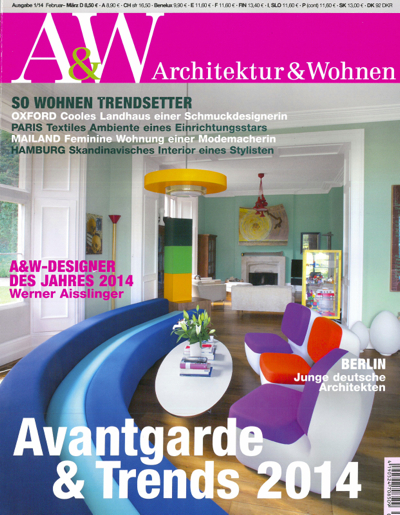 In 2011 I was interviewed for the German interior design magazine A&W Architektur & Wohnen (Architecture & Living), Germany’s answer to Elle Decor. A few months after the interview, I noticed that the story was not published and assumed it ended up on the cutting room floor, never to see the light of day. 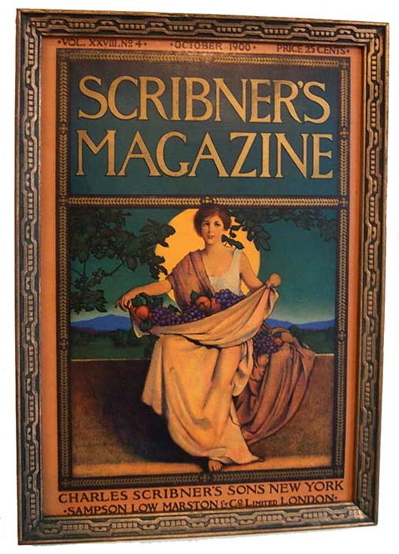 But out of the blue, I just received an email from the writer of the article, informing me that it is currently featured on pages 30-32 of the February issue. So thanks to Claudia Steinberg for writing what appears to be a wonderful article and for contacting me three years later with the unexpected and surprising news. 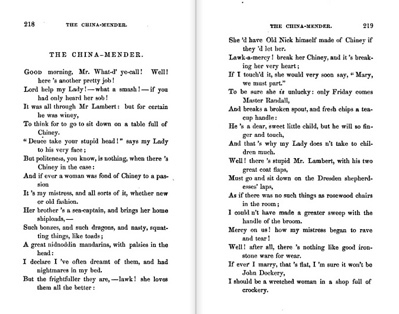 A helpful co-worker of mine, Henrietta Ohno, provided this “quick and clumsy translation” (her words, not mine!) but I appreciate her effort and I think you will get a general idea of the article. “Cemented, hobnailed, patched – the more imaginative an object’s repair the more welcome it is – because it attests affection. A rafter nail serves as this lead dog’s prosthesis, 42 wire clips bond together an early 19th century canary yellow ceramic cup. Four iron band-aids heal the gaping wound of a broken wooden blow from Africa. For New York interior architect and set decorator Andrew Baseman these occasionally dilettante repairs are proof of an imaginative and inventive spirit. He adores these battered objects as survivors of an era without magic glue, in which a scratch, a crack and even a missing handle did not necessarily constitute a death verdict for an object. 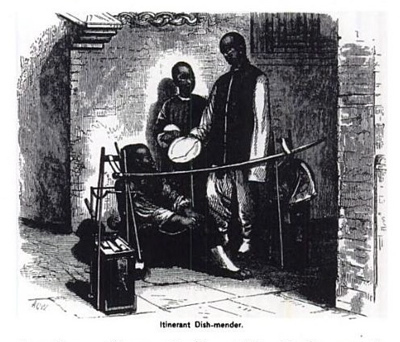 If one listens to him, the metal strap corset doesn’t only offer a second chance to this Chinese tea pot that is missing both spout and handle. The pot also gained in character. Its restoration gives proof of an affection someone once paid their plates and cups. 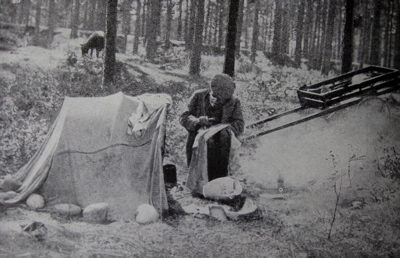 Damaged articles were part of every household until the mid- 20th century. In the Post-war era with its throwaway tendencies they finally got relentlessly discarded. 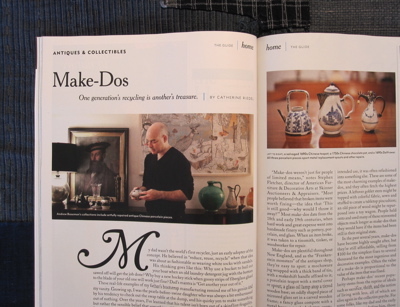 Being raised a son of antique dealers from New England Andrew Baseman grew up with an innate love and respect for old objects. But from early on it wasn’t the flawless showpieces in display cases that fascinated him, but the drawer that held damaged goods. Images and phantasies of human dramas would be awakened at the sight of shards – of scolded children and discharged maids. “It is the nearly fatal accident that alters the course of the fate of damaged statue or sugar set.”, says Andrew Baseman. 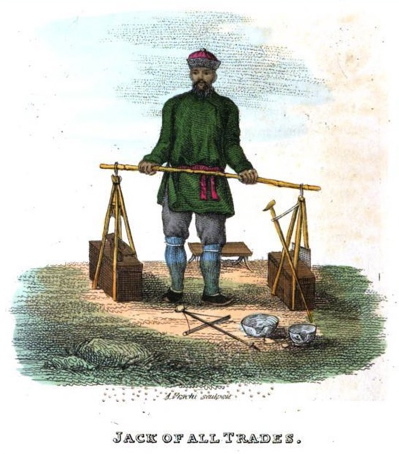 The “orphans” of the antique trade became his passion, a passion not everybody understands. Store owners can react with distrust or even feel offended when Andrew Baseman asks about damaged articles. What does he intend to imply when he inquires about a Chinese vase that has its repaired wound bashfully hidden from first sight? Only in Japan, where a sensitivity for fragility and for impermanence are part of the culture, the mending of a damaged object has developed into an artform. 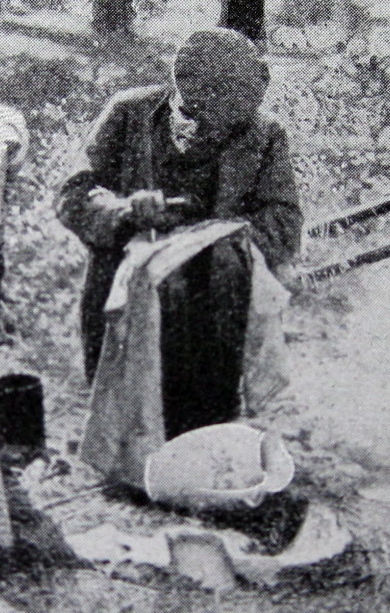 Craftsmen of the 15th Century Kintsugi technique enobled fractures with golddust and laquer in such a way that eventually ceramic jugs and cups were willfully damanged to be repaired in the Kintsugi style. 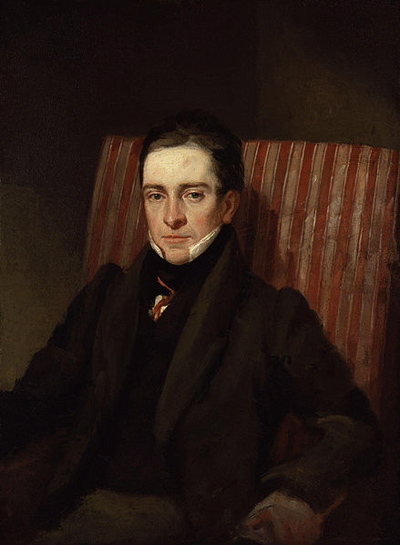 A sense for the innate history of things can be ascribed to the British as well. Since long ago the British aristocracy has had its damaged China repaired with the help of sterling silver, even doll play dishes were mended in such lavish ways. 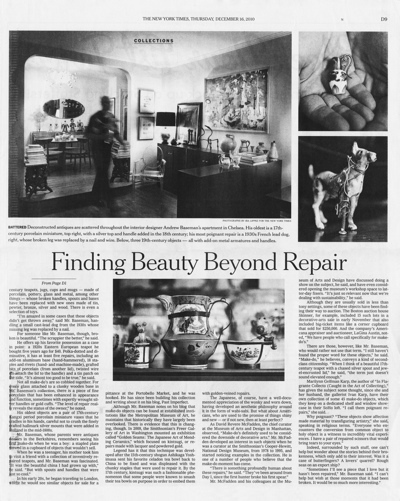 Nearly 3 years ago Andrea Codrington Lippke wrote an article about me and my collection which appeared in The New York Times. 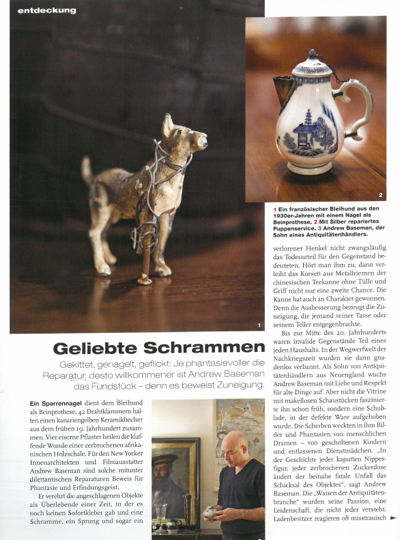 The result of that amazing exposure was overwhelming and I still get emails from collectors and curators worldwide who read the article. I was thrilled to be on the cover of the Home & Garden section and ended up with a 1-1/2 page article with photos, as well as an online slideshow which included 10 more images. But a few photos never saw the light of day. Please take a look at this trio, which were shot for the article but ended up on the cutting room floor. 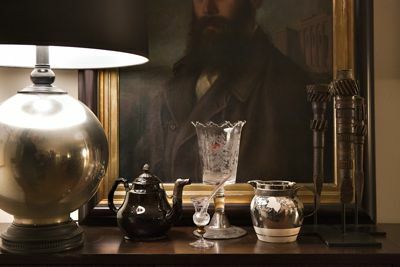 The assembled items for this monochromatic still life include a silver mounted Jackfield teapot, “Scottish Thistle” crystal cordial, etched glass celery vase and silver resist lustre jug. The cluster of 3 objects on the right are metal chisels made from engine parts, “made-do’s” in their own right, which Mark found in a recycling shop in Mali. These pieces all have sterling silver repairs, some with rare hallmarks. As most items with inventive repairs are unsigned, I yearn for anything showing a repairer’s mark. The helmet form cream jug, out of focus in the back, has a uniquely repaired handle made from a silver spoon. 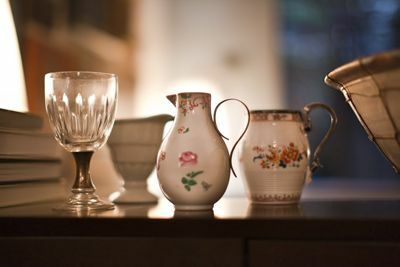 The sparrow beak jug in the center has a simple loop handle with silversmith’s hallmarks, and the Chinese Imari mug on the right has an exquisitely crafted replacement handle. Stay tuned for information on the cut crystal goblet at the far left, which I will post in the near future. And this is the vintage medical cabinet where I keep some of my favorite pieces in my collection, on perpetual rotation. 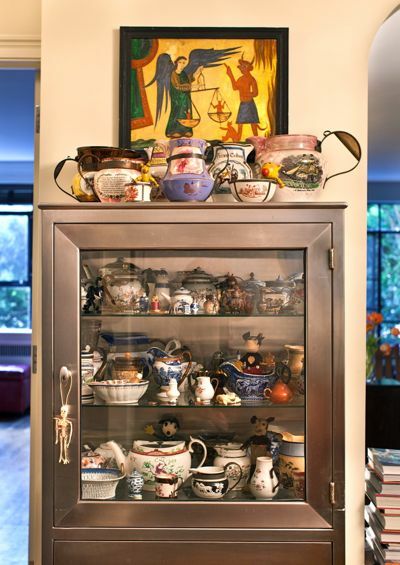 If you look carefully you will see early Micky Mouse collectibles and unusual miniatures mixed in. Thanks again to Andrea Codrington Lippke and Ira Lippke for their beautiful writing and photography! Photos courtesy of Ira Lippke for The New York Times. Steven Heller, esteemed author or editor of over 140 books on design and pop culture, interviewed me last week for an article in The Atlantic. 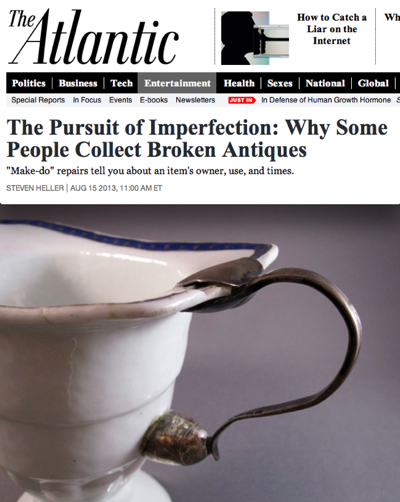 The Pursuit of Imperfection: Why Some People Collect Broken Antiques sheds light on why I collect, write about, and am obsessed with, antiques with inventive repairs. 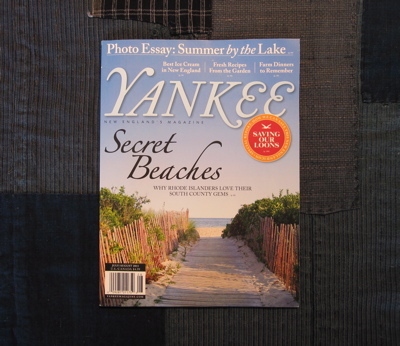 The current issue of Yankee magazine (July/August 2011) contains the story “Make-Dos” (seeing the plural term looks Spanish to me) in the Antiques & Collectibles section, featuring pieces from my collection. 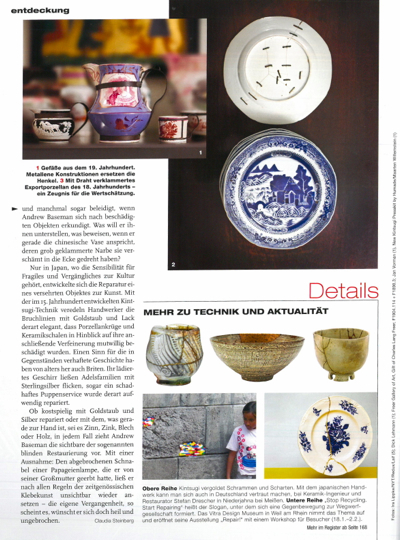 Photographs by Ira Lippke are used to illustrate the well written article by Catherine Riedel. 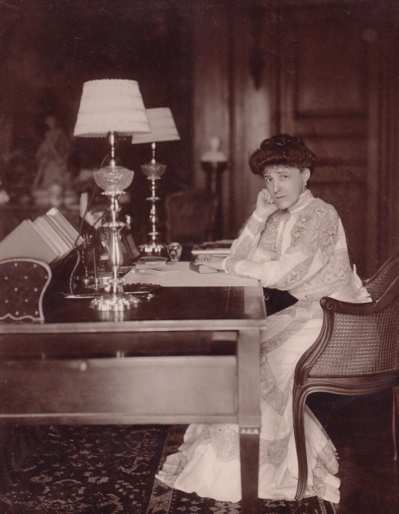 Edith Wharton in The Mount library 1905. MRS. DALE. And denies that the article was ever damaged? VENTNOR. Eh? Well, the great thing, you see, is to keep one’s self out of reach of the housemaid’s brush. (A pause.) If you’re married you can’t — always. (Smiling.) Don’t you hate to be taken down and dusted? 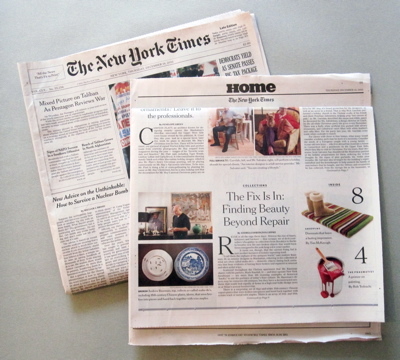 Second-class citizens no more, “inventive repairs” have been acknowledged in an extensive article in The New York Times. 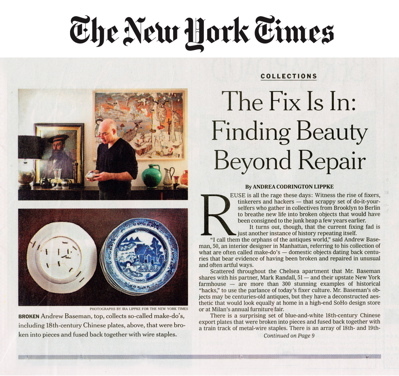 The Fix Is In: Finding Beauty Beyond Repair appeared on the front page of yesterday’s Home section, featuring photos of me and my collection. Andrea Codrington Lippke wrote the wonderful article and Ira Lippke took the beautiful photographs, 11 of which are included in the online slide show. The response has been overwhelming and I appreciate the over 100 emails and phone calls I received, as well as the many new subscribers to this blog. Click here to see the ultimate lighted makeup mirror reviews.